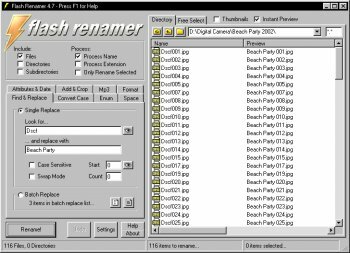 Flash Renamer renames many files at once, so called batch or bulk renaming. Use Flash Renamer to set your filenames to UPPERCASE, lowercase or First Letter Case. Extract and rename with Mp3 ID3 tags to tidy up your music collection. Find & replace strings within the filenames. Set the file date & attributes. Remove unwanted spaces. Add and remove characters at certain positions. Sequential renaming allows you to add number sequences to your filenames. You can also extract useful information, such as width/height, length, bitrate and framerate from movie, music and image files, and put this in the filename.